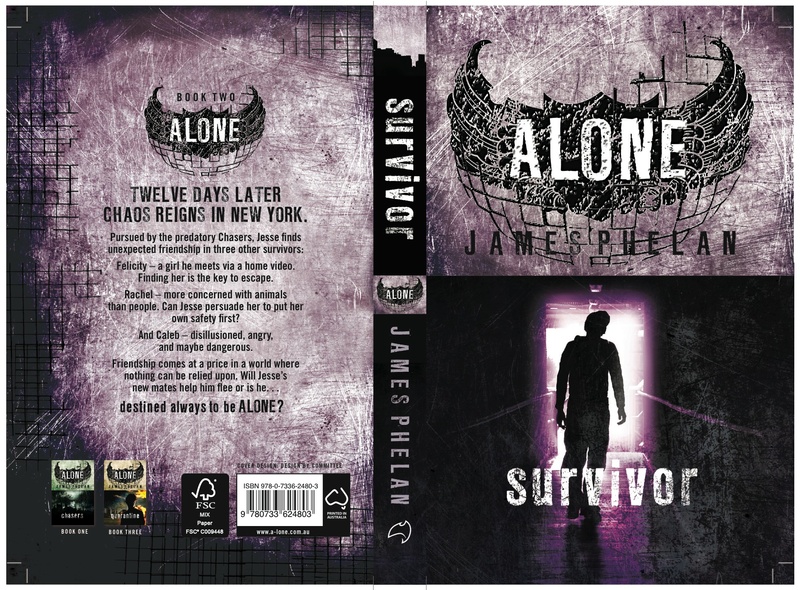 Survivor is the second book in the Alone trilogy, Chasers being the first, and that being so, this review will contain spoilers for those who haven’t read Chasers yet. To give you an idea, it’s a Post-Apocalyptic YA trilogy, and I recommend checking out my review and synopsis about Chasers. On the other hand, if you’ve read Chasers, you don’t have to worry about spoilers, so read on! Twelve days later chaos reigns in New York. Felicity – a girl he meets via a home video. Finding her is the key to escape. Rachel – more concerned with animals than people. Can Jesse persuade her to put her own safety first? And Caleb – disillusioned, angry, and maybe dangerous. Friendship comes at a price in a world where nothing can be relied upon. Will Jesse’s new mates help him flee or is he… destined to always be alone? When I finish a book that I’m going to review, I usually try to write about it straight after so my thoughts are still fresh and I still remember the feeling it left with me, but that wasn’t the case with Survivor. I’m still writing this review within a couple hours of finishing it, but I’m also procrastinating. I finished reading Survivor and opted to potter around the house, do a little housework, and I admit I let out some discontented sighs every now and then because of the book… This sounds like I’m going in a negative direction doesn’t it? I’m not. It’s been awhile since I read a novel in part of a series or trilogy that left me wanting more; left me wanting more enough to lament reading it in the first place and ruing the decision not to wait till the next book! I find Survivor, just like its predecessor, to be one of those books that are hard to put down, make you want to miss out on sleep, and get so sucked in to the character’s world that it can take awhile to come back again. The trilogy so far is, in short, addictive. After the twist at the end of Chasers, and thankfully to a re-read just before I began Survivor, I was left saddened and wondering how Jesse was going to cope with not only his revelation, but being alone from then on. I was a little thrown by where he was when we first come across him because of where the previous book had left him and the idea of where he would be had taken a deep root into my brain, but it soon became clear what was going on and once again I was able to be sucked into his story. The way Survivor is written gives you a chance to mourn and come to grips with the loss of his friends at the same time Jesse does, which is great because that revelation was quite the shell shocking kind if you didn’t see it coming. There’s also no loss in pace and I think given that it is written in first person helps it along quite a lot. There’s the idea that you miss out on so much of what is going on in the background when a story is written in first person, that only knowing what one character knows is a hindrance to the story, but I liked being able to learn what Jesse did when he did and still being left in the dark on a greater scale. It’s not a hindrance to the pace and story, it’s not done in a frustrating way, and for me it helped to add to the mystery of what was going on. And there is mystery that I felt was coming from all sides. For a post-apocalyptic novel that is following this one boy, his journey, his interactions, and without him being right in the centre of things, there was enough going on there to lend to driving the pace, raising questions, and to get your heart pumping. And then there are the new characters and human interactions that Jesse has. Some of these raise more questions, some of these left me thinking that people can be utter jerks, and some of them left me sad, but on a whole I enjoyed all of the characters. They’ve all got their separate drives, and coping mechanisms, and they all help lend to showing more of Jesse’s character and make the plot that much more interesting. Survivor to me is sort of reminiscent of I Am Legend by Richard Matheson. It doesn’t have that crazy full throttle action like a lot of other YA or PA novels do today, but instead is of a more steady suspense that builds up and seeps into your bones leaving you excepting all sorts of things at every turn. Now I’m sad it’s over and I have to wait for the next one, but I’m grateful I might be able to get a bit more sleep for a little while. Hopefully. A Note On Chasers (if you’ve read it) – I just want to say something about Chasers and my re-read of it. I hadn’t read it since last year because I was a little worried that it wouldn’t be as good as the first time, what with knowing what was coming, but I’m glad to say that I was not disappointed. It actually ended up being a little fun in some respects because of knowing what was coming. I found myself paying very close attention to what was going on, seeing if I could see any indicators, just like in the movie Signs (except better).